The FUJINON UA18x5.5BERD covers the focal lengths of 5.5mm – 100mm to capture a wide range of scenes. 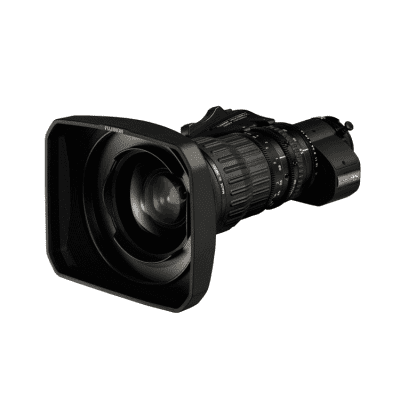 The new FUJINON UA18x5.5BERD broadcast zoom lenses, being released now, deliver 4K quality across their zoom ranges by preventing resolution degradation around the edges and controlling all types of aberrations. The FUJINON UA18x5.5BERD are portable lenses with compact and lightweight bodies for advanced mobility. With the recent market introduction of compact and lightweight “4K camcorders,” these lenses will accommodate an increasing number of videographers who shoot while carrying 4K equipment on their shoulder. While the FUJINON UA18x5.5BERD weighs 2.04kg, it covers focal lengths from 5.5mm on the wide angle end to 100mm on the telephoto end, making it useful for production situations that require added mobility, e.g. news reporting and on-location production for various programs. The lens covers the focal length range from 5.5mm at wide angle to 100mm at telephoto, boasting advanced operability and mobility in a wide range of scenes from TV production and news reporting both indoors and outdoors. It also has a minimum object distance of just 0.4m**.